ROBO-SOC FOUNDER IS queen's STUDENT OF THE YEAR! 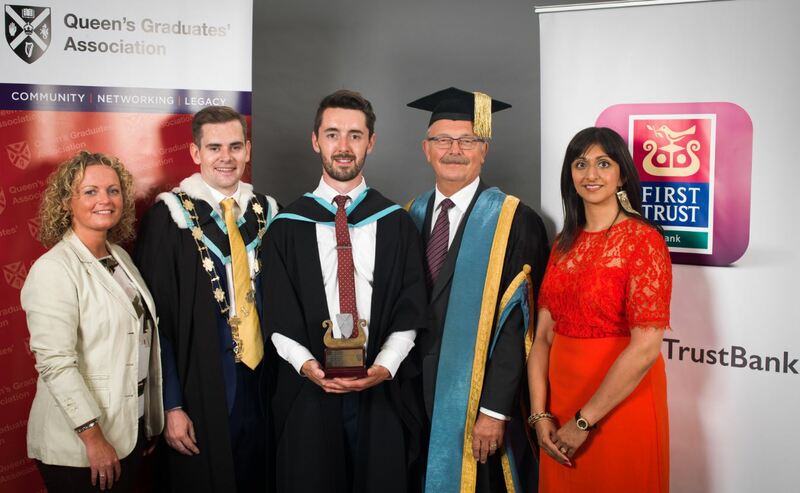 The annual Student Award is presented by the Queen’s Graduates’ Association (QGA) with generous support from First Trust Bank and is one of the highlights of Graduation Week. Now in its 20th year, it recognises exceptional students for excellence, achievement or service either to the University or to the wider community. Speaking about this year’s Award, Mandy Mooney, Retail Manager at First Trust Bank, said: “We are delighted once again to join with the University and the Queen’s Graduates’ Association in the presentation of this illustrious award. “We have been supporting the Graduate and Student of the Year Awards since their inception in 1999. Our endorsement recognises and celebrates the achievements of all those Queen's students who make such an invaluable contribution to life at the University, in Northern Ireland and further afield. Fionnbharr Brady was nominated by his friend and fellow Queen’s graduate Colm Kelly. In his submission Colm said: “I have lived with Fionnbharr for the past few years and watched as he balanced his Master’s degree with starting up the award-winning Queen’s Robotics Society. In the past 12 months, Fionnbharr helped the Society secure over £6,000 from external companies. He also organised the first ever Northern Ireland Robotics League – a hugely successful competition between Queen’s and Ulster University – which had Professor Noel Sharkey of BBC’s Robot Wars as a guest judge.And, thanks to his leadership, the Robotics Society was awarded the Best Academic Society in the Students’ Union Awards. Fionnbharr has represented Queen’s at the British Junior Rowing Championships, volunteered with IAESTE – the international student exchange organisation – to rebuild homes for earthquake victims in Laprak Village in Nepal and served as a Student ambassador at events for prospective engineering students. Commenting ahead of the Award Fionnbharr said: “I am delighted – and truly humbled – to have been selected as the 2018 First Trust Bank Queen’s Student of the Year. I’ve really enjoyed my time at Queen’s; getting involved with University life and giving back to others is hugely fulfilling. Fergal McFerran, President of the QGA, believes that the Award acknowledges all that is great about Queen’s. He said: “This summer’s Student of the Year Award recognises the wide-ranging impact of a gifted individual who is an exemplary self-starter. Caption (L-R): Joanne Earley, Business Acquisitions Manager, First Trust Bank; Fergal McFerran, QGA President; Fionnbharr Brady; Acting Vice-Chancellor Professor James McElnay; Natasha Sharma, Alumni Relations Officer, Queen's University.